* We ship International and USA orders! Paint glass with the professional Glassprimer™ Waterbased GPWB128 self-priming, permanent-bonding glass paint to create modern-sleek colored glass backsplashes, colored glass counter tops, colored glass walls and more! This paint permanently bonds to glass with its glass surface molecular modifying nanotechnology. This paint requires no primer. Paint can be rolled or sprayed on any glass surface. Permanently back paint glass for less than .94¢ per square foot! *If you want your paint to be frosted paint, enter “Frosted” in the enter color code to match field. *If you want your paint to be a specific color, enter the USA paint manufacture name, color name, and color code in the enter color code to match field. *If you want your paint to be pure white, enter “Pure White” in the enter color code to match field. *If you want your paint to be pure black, enter “Pure Black” in the enter color code to match field. *Note: If you want your color to be semi transparent / translucent, please enter “Trans” next to the color you enter in the enter color code to match field. 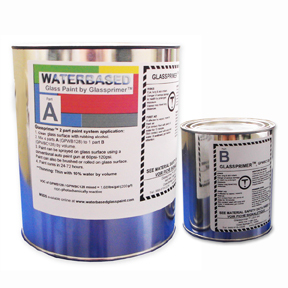 * Glassprimer™ GPWB128/GPWBC128 component “A/B” (Paint/Catalyst) is everything needed to permanently paint glass. 1 gallon (3.78L) of paint and required catalyst. This package will effectively paint over 265sq feet (24 m2) of glass with 3 coats. V.O.C Compliant. *All paint manufacture color code’s can easily be matched free of charge! Click here to browse colors online. *Add to Cart button valid for USA and International orders! Have we made this color for you before? *Glassprimer™ GPWB128 component “A” (Paint) is sold in 1 gallon (3.78L) 1 gallon paints over 265sq feet (24 m2) of glass with 3 coats. V.O.C Compliant.
.*All paint manufacture color code’s can easily be matched free of charge! 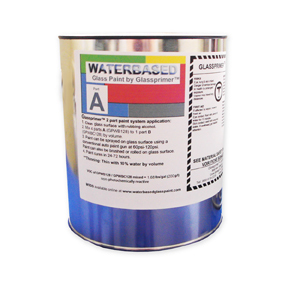 *Glassprimer™ GPWBC128 component “B” (Catalyst) required catalyst for 1 gallon (3.78L) of paint. V.O.C Compliant. We offer free water-based back painted glass samples, just pay shipping and handling. Custom color samples are $175.00 ea, contact us and order one today! *Glass Sample Add to Cart button valid for USA and International orders! Permanently paint glass anywhere with almost no odor! Clean up glass paint with water! Match glass paint to any paint manufacture fan deck color or match to your own color sample. This glass paint bonds permanently to any clean glass surface. Fully self priming. No priming or timely preparations. Already painted glass can be cut, drilled, and sanded without the paint chipping, peeling, cracking, or delaminating. Neutral cure silicone glues, and double sided glazers tapes work great for installing back painted glass! Color match fan deck formula database available online to match your own colors anytime.